planetf1.com • View topic - Mercedes W09 Unvieled! 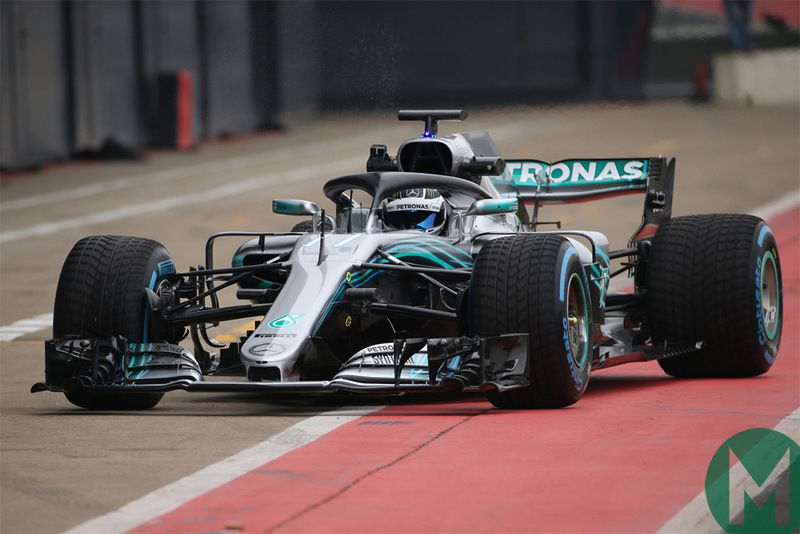 Post subject: Mercedes W09 Unvieled! Last edited by UnlikeUday on Thu Feb 22, 2018 12:42 pm, edited 5 times in total. 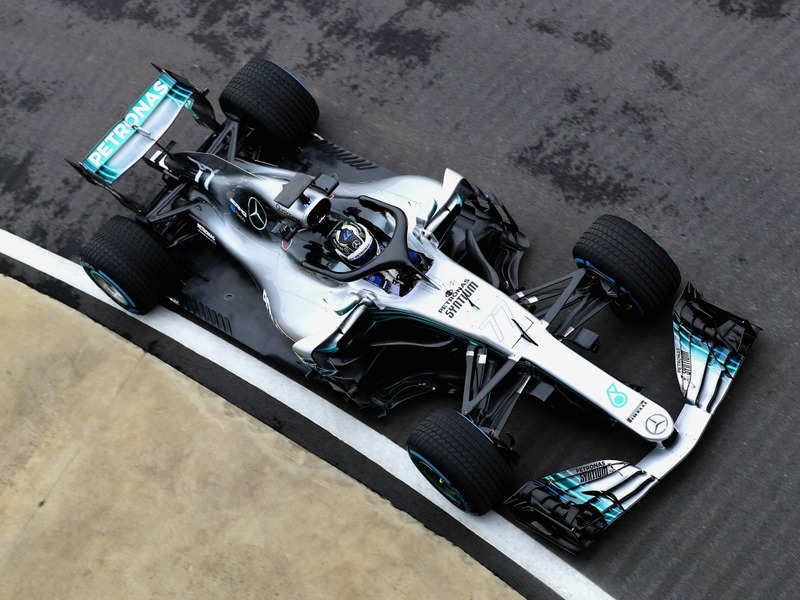 Post subject: Re: Mercedes W09 Unvieled! The car reportedly broke in the pit lane. No miles recorded. Yeah. Renault is the best as of now. Even Sauber looks more pleasing. Finally, a team confident enough to show their car in broad daylight. Is this the first one to show the lower T-wing? The livery is getting really tired. Edit: Spoke too soon. Looks like Ferrari has one too. At least the driver numbers are larger and thus one can identify the drivers easier. I’ve never had an issue identifying the high car is which and when the action is under way I’m too busy looking at all the componentry on the cars and looking to see how close guys get to one another, their braking points, their marks, and one another to bother looking at a number. I have amazing peripheral vision so while looking at all that the helmet color and design stand out in my brain instantly so I know who I’m watching. The T-wing color also registers quickly but you have to know which color is for which driver. Just like last year, this car looks the sleekest thus far. I find it only natural with the static refs that this car is an evolution of last year’s final car. Ferrari seem to have taken a risk by revamping so much of their car but in all actuality the overall shape of it is also close to their 2017 car is decor the side pod inlets. Let’s hope they’re consistently closer than last year. 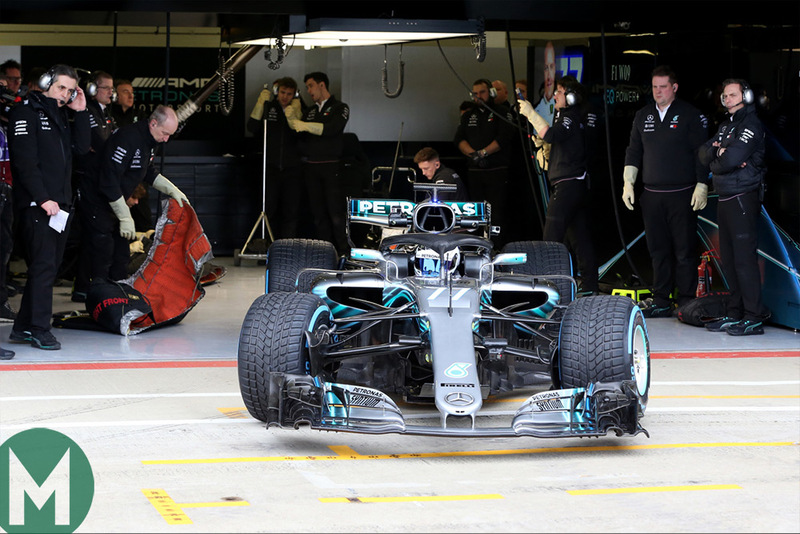 Wheelbase stays the same but rake increased a bit according to Toto. Obviously very happy with what they've got and some nice evolution in the sidepods and rear packaging. I quite like the darker colour at the back of the livery too. Can someone please tell me the name of the presenter who often does Mercedes bits (like interviewing Lewis last year while he drove a Mercedes production car around Malaysia) who did the interviews at the can unveil? She often does the driver interviews during the driver parade too. Mercedes never have the courtesy of naming her in their YouTube videos and I never see her name flash on the screen, the Sky guys never mention her by name either when it goes to her. Just trying to put a name to the face because I think she's always very insightful and fun to listen to as an interviewer. Ugly as hell - like all the new cars. Eh. Just kidding but I'm really hoping they don't just run away with the title(s) once more. I know it probably shows I have a warped sense of perspective, but after thinking my first reaction of well, maybe the Halo does not look as bad as I feared, I wondered has anyone here seen a driver get in or out with it on? Where do they put their feet? It needs a step like a plane. Its also nice to see someone stick with tradition and not change the livery 'just for the sake of it' or to sell lots of new jackets. Video of Bottas driving the car with the halo, looking through a helmet camera, I had to stop watching as it made me feel claustrophobic, it must be a lot worse actually in the car. Looking at that, even with the talk of stereo vision, the obstruction of view of things in the distance directly in line with the central pillar of the Halo must be horrendous. It's off putting just in the video, can't imagine how distracting it is in the flesh. 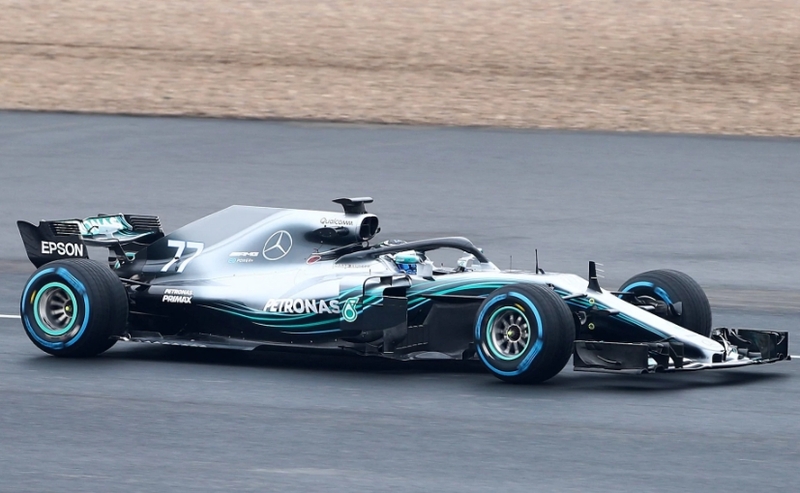 It looks almost exactly like the W08 with a halo stuck onto it. I'm expecting to see a lot more development by the time the lights go out in Melbourne, but right now I'm pleasantly surprised that it doesn't look all that different. The bargeboards are a complete redesign, as is the suspension along with the rear packaging. A lot has actually changed. Yes. I didn't expect anything new. 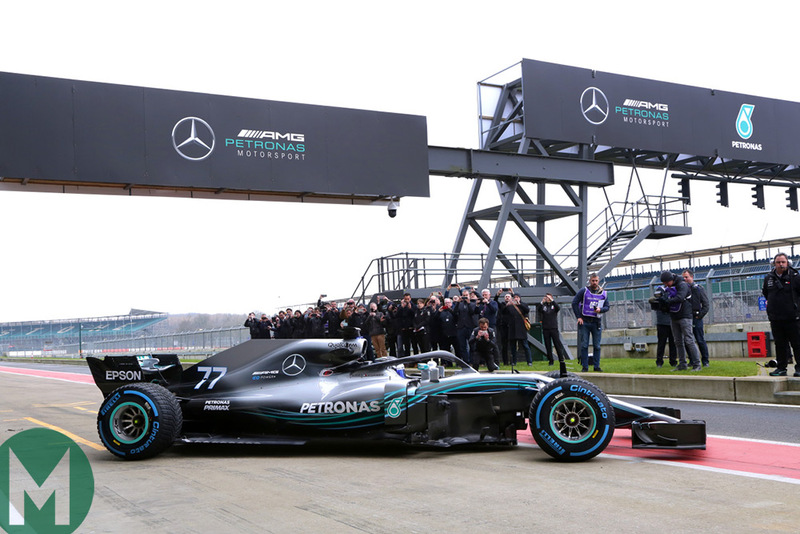 That doesn't mean I ever liked Mercedes livery, but I understand having easily recognisable livery is what they want. It's like Ferrari, everyone knows that red cars are Ferrari. Similarly Mercedes are silver. Yes, some people complain about Williams being the same for 4 years and other teams being similar for several years too. I'm sure I have seen Ferrari be red a few times before. They are the team that probably have the least change overall when looking into the past. It'll only be temporarily off-putting. Enough simulator and driving hours and it just blends in to what you're used to. Even wearing a helmet is massively off-putting for most 'normal' people, but drivers won't consciously notice it over time. I am concerned about blind spots through elevation changes though. Spa will be fun. OT, but Ferrari has raced in blue before... Ok, a long time ago, but blue Ferrari, who would have thought, right? The view will look better once the sponsorship stickers start to appear on the inside of the Halo (in camera view)... NOT! Still a yacht. I thought they were going with a slightly shorter wheelbase, but it's a boat again. Ferrari have increased their wheelbase to match. Mercedes must be confident with it. I agree. I don't care what the drivers are saying initially publicly. This thing will hamper their vision big time. Just wait until they are actually racing in traffic, I expect the complaints to erupt. Worse yet, a major accident can be caused by this. What an awful idea. It also makes it a lot less fun to watch onboard videos now.